Definition at line 34 of file CFunctionParameter.h. Definition at line 70 of file CFunctionParameter.h. Definition at line 42 of file CFunctionParameter.h. Definition at line 55 of file CFunctionParameter.cpp. Definition at line 64 of file CFunctionParameter.cpp. Definition at line 84 of file CFunctionParameter.cpp. References DESTRUCTOR_TRACE, CCopasiRootContainer::getKeyFactory(), mKey, and CKeyFactory::remove(). Definition at line 90 of file CFunctionParameter.cpp. Retrieves the key of the function parameter. Definition at line 102 of file CFunctionParameter.cpp. Definition at line 113 of file CFunctionParameter.cpp. 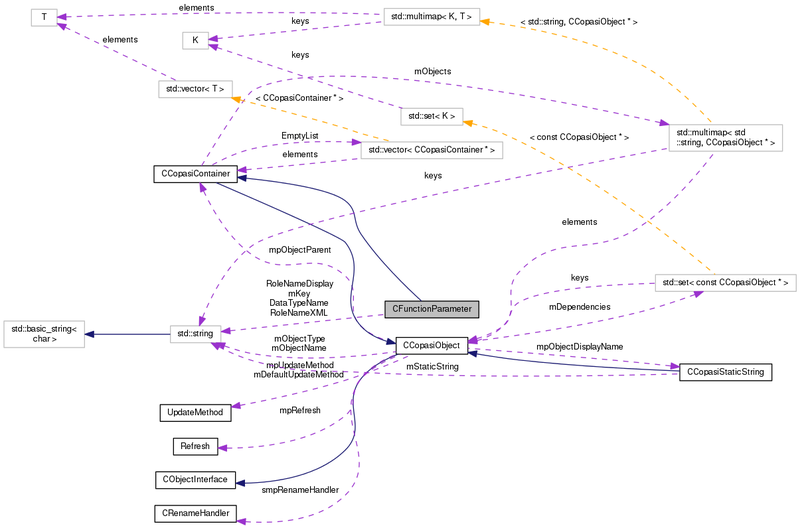 Referenced by CReactionInterface::connectFromScratch(), CModel::convert2NonReversible(), CReaction::loadOld(), CReaction::loadOneRole(), CReaction::setFunctionFromExpressionTree(), and CCopasiXMLParser::SourceParameterElement::start(). Definition at line 106 of file CFunctionParameter.cpp. Referenced by CModel::convert2NonReversible(), CSBMLExporter::createKineticLaw(), CReactionInterface::getDeletedParameters(), CCopasiXML::saveFunctionList(), and CReaction::setFunctionFromExpressionTree(). Definition at line 125 of file CFunctionParameter.cpp. Definition at line 92 of file CFunctionParameter.cpp. References CReadConfig::getVariable(), mType, mUsage, and CCopasiObject::setObjectName(). Definition at line 118 of file CFunctionParameter.cpp. Definition at line 108 of file CFunctionParameter.cpp. Referenced by CKinFunction::createParameters(), and CCopasiXMLParser::ParameterDescriptionElement::start(). Definition at line 104 of file CFunctionParameter.cpp. Referenced by CKinFunction::createParameters(), SBMLImporter::setCorrectUsage(), and CCopasiXMLParser::ParameterDescriptionElement::start(). Definition at line 43 of file CFunctionParameter.cpp. References C_INT32, RoleNameXML, and VARIABLE. Definition at line 128 of file CFunctionParameter.cpp. Definition at line 40 of file CFunctionParameter.h. Definition at line 95 of file CFunctionParameter.h. Referenced by isUsed(), and setIsUsed(). Definition at line 76 of file CFunctionParameter.h. Referenced by getKey(), and ~CFunctionParameter(). Definition at line 83 of file CFunctionParameter.h. Referenced by getType(), load(), operator<<(), and setType(). Definition at line 90 of file CFunctionParameter.h. Referenced by getUsage(), load(), operator<<(), and setUsage(). Definition at line 58 of file CFunctionParameter.h. Referenced by CFunctionParameters::getParameterByUsage(), FunctionWidget1::loadParameterTable(), operator<<(), and ParameterTable::updateTable(). Definition at line 57 of file CFunctionParameter.h. Referenced by CCopasiXML::saveFunctionList(), and xmlRole2Enum().